In other years I’d call Don’t Breathe the most efficient thriller in recent memory. But coming on the heels of The Shallows, and Green Room, and 10 Cloverfield Lane it’s just another in a string of suspenseful genre outings that whittle their compelling concepts down to the bare minimum. Like those other films, Don’t Breathe spends almost no time at all on its setup, putting the plot in motion quickly, trapping its instantly-characterized protagonists in the cold, merciless clutches of its tension. We meet three thieves breaking and entering to makes ends meet and save up to move out of state, their sad Detroit neighborhoods their reality while the idea of sunnier California coastline is their dream. They learn about a house in an abandoned part of town where a blind man sits on a pile of cash. It’s irresistible, but when they go to take it, the robbery goes very wrong very fast. It’s a one-thing-after-another movie locked in a one-location nightmare, the walls closing in on our leads as the story springs its twisted surprises. Writer-director Fede Alvarez, whose 2013 semi-remake Evil Dead was a skilled crescendo of intensity and gore, conducts the proceedings as an exercise in craftsmanship. The leads are sneaking into the house of a man who can’t see, and a great deal of the tension in the early going comes from their silence. Every creaky floorboard or muffled gasp is worth a wince as the filmmakers hold the sound design in creepy near-silence, goosed with stings of music and effective jump scares. (The sensation should be familiar to anyone who remembers the board game Don’t Wake Daddy.) But then their target wakes up, adding the eerie sensation of his presence. They can stand in front of him unseen, dodging out of the way as he barrels down a hallway. Or he aims a gun while they try desperately not to give away their positions before—BANG! — a ringing cell phone on the other side of the room is met with a sudden shot. It’s good stuff, Alvarez confidently and capably moving a smooth camera across the well-defined interior spaces with a sneaky sense of heavy quiet. It’s as if even one wrong camera move would alert the man to the others’ presence. A mirror image of the 1967 blind-Audrey-Hepburn-menaced-by-burglars movie Wait Until Dark, Don’t Breathe somehow keeps the rooting interest in the people doing the menacing. The cast – a sad young woman (Jane Levy, so brilliantly multifaceted in Alvarez’s Evil Dead), her gruff boyfriend (Daniel Zovatto, It Follows), and an almost-innocent inside boy (Dylan Minnette, Goosebumps) – are all veterans of recent scary movies able to play a believable sense of mounting frustration and fear. The burglars are doing a bad thing, but it’s not hard to sympathize with their plight. Their target (Stephen Lang, intense as usual) is a blind man, a veteran, and, we learn, a grieving father. It’s hard not to feel some twinge of guilt over the movie’s setup. But he’s also living in a scarily locked-down house, with padlocks and bolts, bars on windows, hidden firearms, and a wall of saws, bolt cutters, and power tools. What’s he up to? And why, once he wakes up and hears the intruders in his house, does he lock them in and prepare to take them out violently instead of calling the cops? What is he trying to hide? So it turns into a claustrophobic little chess match, with filmmaking that’s gripping and accomplished, if entirely disposable and less interesting the more surprises it unveils. The movie is too fast and lean to really grapple with its character’s personalities, instead choosing a narrow focus on their behaviors. Best is Levy, a great horror heroine on a moral sliding scale that allows her to do bad for the right reasons, while Lang brings more than what’s on the page to a man who may be a target but becomes more of a monster the more we see him do. As is so often the case the movie is better and more compelling when it’s all mysteries, suspense, and how-do-they-get-out-of-this-one? and less interesting the more literal its stakes and clear its motivations. Alvarez saves some sick shocks for the end – not so much the prodigious blood and gore kind, instead relying on truly messed up mental gymnastics of its villain’s plot – but the real fun is how sharply choreographed the simple premise is in its ruthless execution. A true crime story told like a business school case study, War Dogs is about a reckless pursuit of profit leading straight into fraud and disaster. It’s loosely based on the real story of how two twenty-something college dropouts blustered and hustled their way to millions upon millions of dollars in defense contracts during the first years of the Iraq War. In over their heads, they ultimately cut too many corners and bring about their own downfalls, but not before getting filthy rich providing guns and ammo to fuel the military-industrial complex. Recent history, it’s an object lesson in the downside of an irrepressible entrepreneurial spirit. Director Todd Phillips, trying his hand at drama after making the likes of Old School and The Hangover, pitches the movie at the same coarse bro-centric smarm that powers his comedies. In some ways that’s smart, making the characters’ proud ignorance and irresponsible greed a dead ringer for the dominant political climate of Bush-era foreign policy. But the whole project is too clumsy to really activate what’s most interesting about the story. The good version of this movie is hiding just underneath the bad one, which doesn’t trust the audience to follow along. It begins when the opportunistic Efraim (Jonah Hill) discovers that the United States has an open bidding process for defense contractors. Using his knowledge of arms dealing he picked up from his shady uncle, he lowballs on small bids the big companies mostly ignore, and then fulfills them through a patchwork of grey-area backchannels and whole sale purchases. Work pours in, so he asks David (Miles Teller), an old schoolmate unhappily working a massage therapist job, to join the scrappy upstart company. As the only employees, they manage to turn a pretty penny. The war is taking off and the government is willing to look the other way if it means saving money on the arms race. Phillips shoots these early scenes like a cross between Scorsese’s Wolf of Wall Street – with its slick excess and loose morals – and Bay’s Pain & Gain – with dumb guys and big dreams sleazing around Miami Beach cooking up their not-quite-legal plots. That’s compelling enough, with intrigue, double-crosses, and the intoxication of sudden wealth before the hollow pit in the stomach as it threatens to crash down. There’s something compelling about watching these characters find room in the margins of the defense budget to siphon off some business for themselves, fast-talking generals, cooking the books for audits, and even smuggling weapons into Iraq in a rickety truck with an amusingly blasé local (Shaun Toub). Hill and Teller work well together as a study in contrasts, one moving his bulk like a presumptuous smooth fat cat, the other lean and hungry for any scrap. Hill has a braying laugh and intimidating presence, while Teller is meeker, ready to go along with whatever is happening as long as it means money to support his family. His wife (Ana de Armas) exists in the story only to be extra incentive to make ends meet, and to serve as a moral conscience. She’s not a character, but a symbol. Then again, so are the guys, who enter the picture and leave the picture pretty much the same. The plot progresses, but the movie never deepens their relationships or surprises us with new shadings or complications. So it’s not a particularly deep or insightful movie, ultimately a fairly shallow treatment of a story that could’ve been a better unraveling of process. Instead Phillips, with co-writers Stephen Chin and Jason Smilovic, steers into his comic instincts, letting Hill and Teller riff and spar and joke. Throughout he adds layers of explanatory text – obvious symbolism, thuddingly on-the-nose jukebox soundtrack spelling out subtext, endless narration, freeze frames, title cards, and affected chapter headings named for lines of dialogue we’ll hear later in the section. It never stops explaining itself, underlining every motivation and walking the audience through every thought process step-by-step. There’s a great story here, and a good cast up to the task of selling the emotional and business throughlines. (Best is a brief appearance by Bradley Cooper, who effortlessly uses every iota of his star power bringing an infamous arms dealer’s notoriety to life.) But the movie can’t step out of its own way and let what’s so inherently interesting play out unimpeded. Phillips provides a terrific surface slickness, but, like Adam McKay’s The Big Short, the result is a movie that is too afraid the audience will miss the point to take full advantage of the material’s potential. The best parts of Kubo and the Two Strings are its textures. A soft-spoken fantasy film, this latest feature from stop-motion animation studio Laika has gorgeously tactile creations. That’s a feature of the form, where the characters look like stunningly molded action figures and dolls posed against striking dollhouse spaces. But the craftspeople and artisans at Laika (now as much a consistent high-quality brand as Pixar, Aardman, or Ghibli) are thorough imaginers, able to create a sense of magic in movement and sturdiness in worldbuilding. They also can mold their house style to a variety of tones and moods. Look at their works: dark Gaiman fable Coraline; family-friendly Carpenter-influenced horror ParaNorman; whimsical Dahl-meets-Dickens-meets-Monty-Python allegory The Boxtrolls. With Kubo, the company has a project that takes on the flavoring of ancient Japanese legend, from samurai tales to paper lanterns and a sense of fluid boundaries between the mortal and the spiritual, the fated and the created. It’s a very different sort of family fantasy: hushed, gentle, simple, spare. Its widescreen story begins with Kubo, a one-eyed young boy (Art Parkinson) alone with his mother in a cave at the edge of a small village. He earns money for food by performing stories for the villagers, with heroes, villains, and monsters he animates by making origami puppets come to life with his magic stringed instrument. He strums and narrates while the art acts out his tales. Soon, though, he’ll be in a real hero’s journey of his own. His mother always says never be out at night. They have a tragic backstory. Kubo’s grandfather and aunts on his mother’s side are cruel moon spirits who stole his eye when he was a baby, killing his noble samurai father in the process. His mother has since hidden them to protect the other eye, which they still crave. If moonlight spots the boy, they will return to collect. Alas, this is what happens one night. Kubo is attacked, and his mother uses her last bit of magic to spirit him away and conjure a protector. What follows is a journey for the items that will save his life, told in a mood as delicate and involving as the origami tales he tells. This is fascinating and intriguing fantasy setup, patiently and slowly unfolding its world. It’s less about its simple story, but more about how rich its visual opportunities are and how consuming its tone is. The boy awakes to find his monkey figurine is now a real monkey (with the voice of Charlize Theron), maternal, stern, and skilled in martial arts. She’s his mother’s final gift. Together they must go on a fairly standard quest set up in threes. There are three travelers: the boy, the monkey, and a man-sized beetle (Matthew McConaughey) they meet along the way. Their goal is finding three mythical objects to help them defeat the enemy: an unbreakable sword, impenetrable armor, and a golden helmet. Getting those involves three deadly obstacles: a giant skeleton, underwater eyeballs around a reef-sized toothy maw, and a dragon. And there are three villains to be confronted: Kubo’s twin porcelain witch aunts (hauntingly voiced by Rooney Mara), and his grandfather, the evil Moon King (Ralph Fiennes). Screenwriters Marc Haimes and Chris Butler, with story credit to Shannon Tindle, use these threes to structure a movie of repetitive rhythms, like an easy-to-recall bedtime story with exciting incident and imaginative sights told in a comforting pattern. In typical Laika fashion, director Travis Knight allows the movie to move at its own pace, and take on its own distinctive character. It’s a story of melancholy and loss, with real life-and-death stakes and a reverence for the fragile line between the living and the dead. An early sequence finds villagers earnestly communing with the spirits of relatives who’ve passed on. This makes Kubo jealous, but as his journey brings him closer to memories of his parents, he draws on their example as well as the inner strength (and magic) they’ve left in him to do right. This is quite a somber topic for a family film, and it’s allowed its due seriousness. It informs the movie’s whimsy without trivializing the ambiguities and mysteries it works through. This is still, after all, a movie in which a talking monkey has a dazzling swordfight with a ghostly moon spirit who comes gliding in on spooky CG fog, a sailing ship is made out of twigs and leaves, and a beetle-man scurries to the top of a giant skull to pull out a sword imbedded in it. There are magnificent and creative sights used for quiet, minor key effects. It’s fun, but slower and sadder than you might expect. It's like a spell. No wonder the movie begins the same way Kubo starts his origami tales, as the paper folds itself into delicate astonishments: "If you must blink, do it now." When Disney tasked David Lowery, director of 2013’s hushed and self-consciously artsy crime movie Ain’t Them Bodies Saints, with remaking their half-remembered 1977 live-action/animation-hybrid roadshow musical Pete’s Dragon they must’ve known they’d be getting a radical reinterpretation. The original movie, a simple boy-and-his-dog story in which the dog is a friendly, occasionally invisible, hand-drawn dragon, is a broad, galumphing, protracted, insufferable, fumblingly wacky thing. Lowery’s update is a complete improvement, excavating the title and central relationship, changing and elevating the rest. I’d go out on a limb and suggest the result is far better than even the wildest studio expectations. Here’s a movie that’s sensitive and tender, about a boy who is orphaned in a car wreck and left to fend for himself in the woods of the Pacific northwest, making an unlikely friend in a big, furry, green dragon. Lovingly and patiently told, the movie is reverent with tough material artfully suggested, and an impressive respect for the mind of a child. Firstly, Lowery and his co-writer Toby Halbrooks approach the movie with a great degree of seriousness in representing the mindset of their lead. While Pete grows to love and trust this creature, we see the confidence and tenaciousness of childhood innocence enduring in the face of trauma. After six years in the woods, he’s discovered by people from the nearby town, including a forest ranger (Bryce Dallas Howard) who takes him in while investigating his situation. He’s at a loss upon returning to the human world after several years as a wild child, his long hair and fiercely intense stare telling the story of his troubles and his survival. He yearns for a family, but separated from his dragon he can only think of running back to the home he knows. Lowery works with young actor Oakes Fegley to make a wholly convincing performance that’s unlike other kids’ roles in big CG-heavy spectacles. It’s closer in tone and effect to Jacob Tremblay in Room, or a similarly feral boy in Truffaut’s The Wild Child. Here’s a real boy in unreal circumstances. This leads to the movie’s second welcome expression of respect for children’s minds. It’s a movie that understands a young audience’s ability to be drawn in by quiet and contemplation pitched at their level without a hint of condescension. Lowery has cinematographer Bojan Bazelli (The Lone Ranger) make still, soft poetry out of sun-dappled forests, which are ultimately as magical as its central effects’ performance. It paints a world of wonder, majesty, and scale, a young boy dwarfed by the natural world and then slowly coaxed out of it into society once more. There’s a real beauty and appeal to the world of the trees and hills, and a real boys’ adventure understanding of building a life there. It knows that fear of the unknown can hold you from living a better life, but the soft fear of the everyday can hold you complacent in a situation that’s not ideal. Tough stuff, but the filmmakers expect children to follow. Lowery is allowed the confidence to make effects secondary and bring to the fore human-scale emotions so elemental and simple that he need not surface them explicitly. For once, a family film leaves its emotional underpinnings unspoken, with faith in the intuitive interpretative power of children. It works because the movie is so precisely cast, with Fegley’s strong child performance anchoring a sharp and clear ensemble. Dallas Howard projects maternal warmth, and it’s easy to see why the boy would be drawn to her as a protector and a sympathetic ear. She’ll be needed to protect him and his dragon from hunters (led by Karl Urban) who wish to capture the legendary beast. Other kind adults include Robert Redford, bringing decades of weathered stardom to a subtle and warm effort of grandfatherly charm, and Wes Bentley as Howard’s husband, a man who hardly believes in the magic around him. Then there’s their young daughter (Oona Laurence), who is skeptical but eager to get involved in helping this strange boy. It’s a movie about childlike sense of wonder and possibility, but with grounding in reality. Confidently moving in its portrait of the good parents can do, and the pain a friendship can alleviate, it’d be a fine drama without the dragon. But there is a dragon, and it’s the last piece in the movie’s emotional core. The movie turns on the relationship between a kid and a special effect, and it works as well as it did in E.T., Free Willy, and The BFG (Disney’s other good soft-spoken wonderment about an orphan and a towering magical being this summer). Lowery makes the smart choice to shorthand the emotional connection by making the impressively tactile CG creature not an impish animated sidekick but a big, furry, endearing, overgrown puppy dog. An early scene finds the fantastical animal quizzically tipping his head to fit a log he’s carrying between his teeth through a narrow opening between two trees. It’s such a dog-like action, as are his soft cries when Pete goes missing, and his wet-eyed search for the boy as he softly wings his way towards town. He’s playful and protective, capable of cute energy and growling loyalty. It’s smart to make him at once oversized astonishment, and a down-to-earth pet. The movie embraces stillness and silence, has long passages of human emotion set to wistful folk music and a melancholy mood, but it somehow doesn’t diminish the dragon or make him seem out of place. As the movie escalates to effects and a flourish of climactic action, it still places him in the frame as just another character. (One shot even holds him out of focus in the background while humans tearfully reunite, a sight so casual it takes a moment to realize how daring it is to spend part of the animation budget on a shot where it’s not the focus.) We’re to be amazed not only by what happens, but how it plays out in its characters’ feelings and relationships. This is a rare family movie of restraint. It doesn’t rush manically from setpiece to setpiece or gag to gag. It unfolds patiently, allows itself the time to let characters inhabit believable physical and emotional spaces, and trusts in its audience’s ability to care without any more handholding than a soaring score and strong performances at its heart. If this is what can happen when you give a remake’s reigns to smart filmmakers with real vision and something meaningful to communicate, than Disney should do this more often. The sheer number of CG animated movies about anthropomorphized animals and objects, from Pixar on down to their lowliest imitators, leaves an opening ripe for parody. Enter Seth Rogen and Evan Goldberg (co-writers on the likes of Pineapple Express and This is the End) with the idea to go hard-R on the Pixar formula. In Sausage Party they imagine the world of a grocery store from a food’s-eye view. The cartoon products sing an Alan Menken song about how much they wish to get purchased and live forever with their gods (us) in the Great Beyond. Little do they know certain death and digestion await. It’s a funny idea, and mostly follows through to its logical conclusions. But in pitching the humor they go too high and too low, reveling in an allegorical approach that’s a cockeyed consideration of religion and mortality, and in a nonstop barrage of four-letter words and innuendoes. The manic pace hammers away nuance with glee, and the execution grows thin, repetitive, and one-note awfully quickly. It starts with the idea that the store is split up into its own little countries, each aisle organized around racial and cultural stereotypes of their respective cuisines. The only thing that brings them all together is worship of the shoppers. But when a hot dog (Seth Rogen) gets a hint about the truth of what sits beyond the sliding doors, he’s desperate to get proof and bring a nihilistic, hedonistic brand of atheism back to his brethren. He and his hot dog bun lover (Kristen Wiig) get lost in a tragic shopping cart accident shot like the opening of Saving Private Ryan, with a ripped open ramen cup trying to stuff his noodles back in, a jar of peanut butter weeping over spilled jam, and a banana with its face slowly peeling off. That’s a fun bit of inspiration, but the movie grows repetitively insulting as it winds its way through nonstop ethnic jokes. The hot dog and his bun-to-be, who are waiting until after purchase to get together (there’s no buns- or sausage-related innuendo that goes unspoken), wander through the store looking to get back to their aisle. Each stop on the way brings them into contact with an endlessly condescending parade of stereotypes and racial humor. The Mexican foods (including a lesbian taco voiced by Salma Hayek) drink all day and follow secret tunnels to better lives. The Chinese foods speak in exaggerated rolling Ls and Rs. The German food wants to eliminate all the juice. The Middle Eastern lavash (David Krumholtz) feuds with a bagel (Edward Norton doing a Woody Allen impression) he thinks is unfairly settling in his aisle. The fruits are lilting lispers. The grits (Craig Robinson) is a blaxploitation gangster. The firewater (Bill Hader) is a Native American whose every appearance is signaled with an eagle’s cry. It’s a pileup of the worst kinds of tiring wink-wink racism and prejudice in pursuit of anti-racism and cross-demographic understanding. It’s so wearing, asked to laugh again and again at this sort of thing as the movie demands to feel like it’s okay because it reaches the right conclusions. Rogen and Goldberg (writing with The Night Before’s Kyle Hunter and Ariel Shaffir) want to make a filthy adult comedy that parodies the style of the CG kids’ movie while still having a clear moral message. In other words, it’s an adults-only kids’ movie, and every bit as juvenile, wrongheaded, and infantilizing as that sounds. The movie remains on a fairly obvious level, relying on the shock value of hearing cartoon characters swear, get violent, and express sexual urges. (Anyone who thinks that’s a new idea should talk to Ralph Bakshi.) The thing is, the writers have imagined a funny world and have an interesting perspective. They have plenty of smile-worthy puns that go down easy. Why insist on such a barrage of cynical cheap shots? Other distasteful ingredients include swipes at the disabled (consider the plight of a deformed sausage (Michael Cera) whose only soul mate can be a smushed bun) and a scene in which a feminine hygiene product (Nick Kroll) sexually assaults a juice box. (You read that correctly. That happens.) Sausage Party crosses the line, not because it wants to make an R-rated animated movie, but because it allows itself license to push further than it should with such touchy material. That it’s sometimes funny, and tethered to a surreal premise, doesn’t alleviate its uglier impulses. Directing this perverse sledgehammer to propriety are veterans of CG family films Conrad Vernon (of a variety of DreamWorks features like Madagascar 3) and Greg Tiernan (of Thomas the Tank Engine products). They clearly relish cooking up the movie’s crass and disgusting surprises, but it’s also clearly done on the cheap. The character designs are all slightly off, not just the ugly food, but the stiff and wobbly humans lumbering over them as well. The sets and locations appear Saturday-morning simple and crude. It’s just not quite right every step of the way, in every way. It has a fine setup and some truly jaw-dropping final moments staggeringly inappropriate and in many ways inexplicable, but at least relatively non-toxic – a massive pansexual free-for-all followed by a surprising smashing of the fourth wall – compared to what comes before. But by that point the movie’s been such an obvious, overdetermined, obnoxious slog, it’s hard to cook up much interest. Late period Woody Allen is certainly filmmaking that’ll charm those already predisposed to finding comfort in his rhythms and style – the unwavering font, the American songbook score, the familiar character types, the thematic concerns of a midcentury pop philosopher – and deter those who’ve tired of his tricks (or his personal life). He can still provide a surprise now and then – last year’s Irrational Man was a (probably) self-aware curdling of his tropes; 2011’s Midnight in Paris had lovely French time-travel romanticism – but you mostly know what you’re going to get. Well, you make a new movie a year for over four decades and see how many new topics and techniques you can come up with. 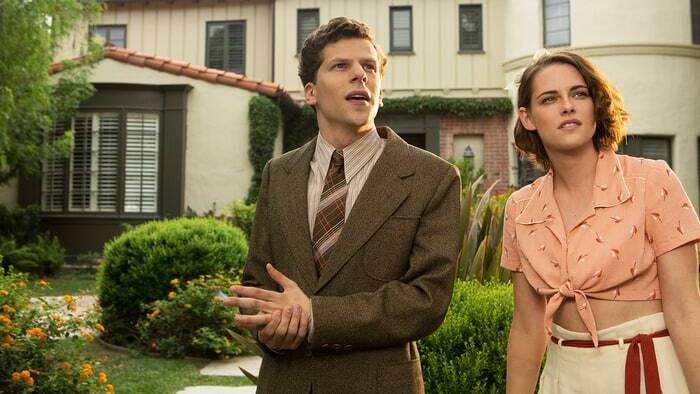 So it’s no surprise Café Society, this year’s Allen feature, finds him noodling around with ideas he’s used better before. There are unrequited romantic connections, affairs, insecurities, intellectual posturing, an ambitious and sensitive young Jewish man and his family, and the wistful melancholy of nostalgia. It’s not Allen’s best representation of any of the above, lightly skipping across the surface of places where his writing has other times deepened. One of his period pieces, it’s told in a brightly artificial simulacrum of New York and Los Angeles of the late 1930s, the better to keep the jazz flowing on the soundtrack and the arch reproduction pseudo-literary stuffiness of the dialogue era-appropriate. Jesse Eisenberg stars as a squirrely young New Yorker who on a whim moves to Hollywood in hopes his uncle (Steve Carell), a high-powered agent, will find him a job in the industry. His mother (Jeannie Berlin) calls ahead and tells her brother to help, but the agent brushes her off. He’s too busy to look after his nephew, but after weeks of waiting relents and puts the eager young man to work running errands. This gets him working closely with a sweet, smart assistant (Kristen Stewart) with whom there’s instant infatuation. Too bad, then, that she has a mysterious unseen boyfriend, a married man whose identity is eventually revealed to be a character we’ve already met. Standard setup, the plot and dialogue are merely going through the motions, but there are some small glimmers of life amidst the artifice. The early, breezy passages of the movie are a mild warmed-over farce, with characters jostling for attention and obscuring truths. It has low-key charms, but the cast remains posed and situated in the precise, and precisely too-perfect phony, period detail. It looks not like events lived, or situations performed, but games of make-believe staged for our benefit. It’s not a cast; it’s people in costumes. Still, the actors do what they can. Stewart, who unfailingly brings a real sense of grounded presence to the screen, is the highlight. She has a scene where she has to keep feelings hidden while reacting in shock and pain as one lover unknowingly recounts a slight the other shared in secret. The emotion is plain on her face in a twitch of the eyes and a slight shift of the jaw, and yet it is entirely believable that her scene partner wouldn’t notice. A close second for most valuable player is Berlin, grounding a stereotypical Jewish mother role with lived-in conviction. Eisenberg, for his part, plays the Allen-impersonation trap, stammering and twitching, stumbling through wordy lines. And Carell puffs out his chest for a shallow impersonation of an early-Hollywood powerbroker type. As the film progresses Allen balloons the small, simple, obvious premise into something approaching a sprawling semi-comic family drama. We end up following Eisenberg’s character for several years past the end of the farce, through its fallout and into what’s surely at least a decade of time passing. Threaded throughout are cutaways to Corey Stoll as his two-bit gangster brother who opens a café (and draws in a bunch of high society) while staying a step ahead of the law. (That many of these cutaways are quick gags about gruesome murders is an odd hitch in the otherwise pleasant, even-keel tone.) Other people floating through the supporting cast include a glamorous divorcee (Blake Lively), and a sharply dressed bicoastal power couple (Parker Posey and Paul Schneider). There’s some fun in the mostly intelligent casting, though not every character crackles with the right interest, and not every actor is up to delivering or improving upon what they’re given. Better small pleasures are in the humble glowing cinematography from the legendary Vittorio Storaro (of such beautifully photographed films as The Last Emperor and Apocalypse Now), who captures warm sunny contrasts and, in one striking shot, a luminous, dusky, full-color angle on a bridge that recalls Manhattan’s famous shot. With a pretty surface exploration of a small variety of relationships, it slowly becomes a melancholy movie about missed connections, about people who’d rather live in denial than face up to the ways they’ve hurt others. And even then the denial slips, leaving them contemplating their choices with regret. That’s a great flicker of life, but embedded in half-thought and underwritten scenes which often seem to grasp for obvious lines and hanging lampshades on thematic points already plainly visible above the subtext. For instance, a character actually trots out the old “an unexamined life…” saying unironically, before putting a spin at the end in a hacking punchline. Like so many of Allen’s lesser works, it’s underwritten. A great performer with a reasonably complicated part like Stewart or Berlin can be lively, dry, funny, and convincing, but smaller roles and lesser actors flounder as the plot and mood slowly peter out. Scene after scene sits flat and tired, jolted occasionally with the sparks of the better movie it could’ve been with another draft or two. 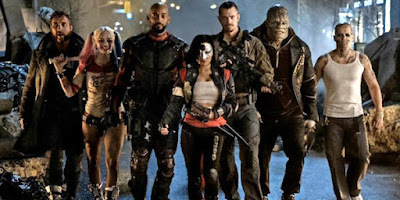 Suicide Squad is an ugly, shapeless, and noisy pileup of bad ideas and sloppy execution for so long it’s almost a relief when it gives up the pretense of doing something remotely new with the superhero genre and collapses into the same predictable CG autopilot required of every movie of this kind. The concept sounds terrific on paper: a Dirty Dozen made up of lesser-known villains from Batman’s rouges gallery. A tough security adviser (Viola Davis) gets permission to recruit the worst of the worst from a maximum-security prison to send on certain-doom longshot missions against supervillains. Who can say, her reasoning goes, if the next Superman will turn out to wish us harm? And who, if that happens, could stop him? That’s a clever hook, theoretically able to look at a superhero world from a different angle. And yet this movie can barely figure out how to tell its story, loaded up with false starts and weak characterization, roping in endless exposition and tonal whiplash until finally it just turns into a CG shooting gallery. There’s trouble right at the start as the movie introduces the Suicide Squad haphazardly and repeatedly. First, there’s a prologue tour of the prison where we meet a few of the big stars, including Will Smith as preternaturally accurate hitman Deadshot and Margot Robbie as mentally unbalanced crime jester Harley Quinn. Then we follow Davis to a dinner meeting where she pitches her idea for a team of super-powered criminals. She reads their names and describes their abilities, which are repeated in on-screen text popping up next to freeze-frames in extended flashbacks. There’s a guy who’s really good at throwing boomerangs (Jai Courtney) and a firestarter (Jay Hernandez), and a guy who looks like a reptile (Adewale Akinnuoye-Agbaje). Then we’re with the squad’s military leader (Joel Kinnaman) meeting the bad guys all over again, even repeating some footage we’ve already seen. Yet then we’re still finding out about new people – a witch (Cara Delevingne), a masked woman with a sword (Karen Fukuhara), a guy who is really good at climbing (Adam Beach) – with a tossed off explanation or belabored flashback as they show up. Surely there was an easier way to establish the ensemble than all these convoluted repetitions. Writer-director David Ayer’s previous film, World War II tank actioner Fury, was also a men-on-a-mission ensemble effort, but it allowed its cast to build a rapport in a plot that had a streamlined sense of purpose with real weight. Suicide Squad feels hacked to pieces and carelessly stitched back together with whatever bits were easiest to pick back up. It’s airless cacophony, sloppily constructed out of competing impulses, less a movie, more a collection of moments indifferently assembled. It’s badly lit bad behavior trying very hard to be adolescent edgy, casually dropping PG-13 profanity and endless rounds of gunfire, random murder, and police brutality. The movie trades on images of cruelty and smarm, sexualizing or tokenizing its women and stereotyping its characters of color. It revels in unpleasant violence and mayhem, carrying on with machine gun assaults and squirmy intimidation, eventually introducing an army of faceless zombified citizens with craggy rock faces blown to bits in headshots and decapitations lovingly displayed. This may be the most violent PG-13 I’ve ever seen, not only for its explicit nastiness, but also for the general nihilistic spirit. The heroes are villains – one of the intended Suicide Squad is the arbitrary nonsensical Big Bad – and the villains are heroes. And yet it’s a muddle with no true north on its moral compass. Good and bad don't mean anything. It features an assassin we’re to like because Will Smith is charming, and Viola Davis – our rooting interest, mind you – ruthlessly murdering innocent colleagues. Good guy Batman (Ben Affleck, making a stop between Batman v Superman and next year’s Justice League) briefly appears to punch a woman in the face. And Thirty Seconds to Mars’ frontman cameos as the Joker (surely among the most breathlessly overhyped performances in movie history), massacring dozens, but we’re supposed to go easy on him because he’s doing it for love (of the woman he’s abused). Some of the characters’ origin stories are so horrific – like Harley Quinn, a psychiatrist tortured to insanity by an inmate – that it’s sad to see them ground under the movie’s flippant approach. Robbie, a fine actress, is tasked with playing Harley as a walking quip in hot pants objectified in every frame, a difficult thing to reconcile with the coy references to her trauma. Yet still others go entirely uncharacterized, like the boomerang thrower who has a gargling Australian accent and that’s where his character traits end. Because there’s no clear perspective beyond rank “ain’t I a stinker?” self-satisfaction and the whole thing grinds to an inevitable, if indifferently set up, conclusion of metropolitan carnage with a CG creature summoning apocalyptic beams of light shooting into the sky, nothing connects or makes an impact. There’s no sense of shape or momentum to the story. The team never makes sense as a unit, and the characters never come to life beyond whatever fleeting moments of personality the better actors can manage. In the early going, scenes are placed next to each other in what might as well be random order. By the time it settles down it’s dreary and predictable. It certainly doesn’t help how misjudged it is on every aesthetic level. The dialogue is flat and half-aware. The smeary cinematography is dim. The production design is like an explosion at a Hot Topic. It’s scored with a busted jukebox puking out snippets of obvious tunes (a bad attention-deficit copy of the Guardians of the Galaxy mixtape). The whole thing is one futile attempt after the next to make boring or baffling or distasteful moments something like entertainment. So loud and obnoxious, overstuffed and undercooked, it’s ultimately just tiring. It definitely puts the anti in anti-hero. Matt Damon last played Jason Bourne in 2007, when The Bourne Ultimatum closed out a thrilling, cohesive action trilogy – and the character’s central drive – with the amnesiac rouge black ops agent learning the truth of his identity and exposing associated CIA misdeeds. Director Paul Greengrass said that he thought Bourne’s story was done, saying further sequels starring the character should be called “The Bourne Redundancy.” That’s why the fourth film was The Bourne Legacy, a terrific spinoff focused on a different agent who grows a conscience that puts him at odds with his agency handlers, which found writer-director Tony Gilroy deftly expanding the scope and possibilities for the future of the franchise. But now, somehow, the fifth time around has lured Greengrass and Damon back for more in the bluntly titled Jason Bourne. It’s a step backwards into the series’ comfort zone. Is there a good new story to tell about this character nearly a decade after we left him? Not particularly. But at least it has a decent grinding competency about it, a solid sense of shaky contemporary paranoia, and a couple great action shots. Bourne, having spent the better part of ten years off the grid and on the run in the farthest overlooked corners of the world, is suddenly pulled back into the world of espionage and globetrotting skullduggery when an old ally (Julia Stiles) tracks him down. She’s uncovered yet another dirty secret about the CIA’s past involvement in his life. So off he goes, leaving his existence of lonely uncommunicativeness and earning money through backwater underground fighting, to once more look determinedly through binoculars, walk with grave purpose through patient multi-step traps and rendezvous, and slowly work his way into confrontation with the suits who conspire against him. Playing like an unnecessary epilogue to an already complete character arc, the new movie nonetheless operates from a baseline competency not unlike its protagonist’s. All superfluous movies should strive for such slick watchability. It’s restrained and methodical and, when all is said and done, accomplishes very little. But everyone involved is too much of a pro to let it be without some entertainment. Greengrass, who also co-wrote with editor Christopher Rouse, has a handle on the mood of the piece, and is able to sustain mild interest in dependable scenes of great actors plotting and scheming and debating what to do while they glower at screens and bark into cell phones. He has Tommy Lee Jones as the agency’s director playing a sad-eyed cynic, a part that’d be described as a Tommy Lee Jones-like part if a lesser actor had been cast. He wants Bourne hunted down and to do so activates another in the series’ endless supply of covert killers (Vincent Cassel this time). Then there’s Alicia Vikander, the fresh-faced ingénue straight from a string of much better roles (like in Ex Machina, The Man from UNCLE, and an Oscar-winning turn in The Danish Girl). Here she's an ambitious young agent in normcore clothes who is determined to bring Bourne back into the fold instead of leaving him dead in the street. Elsewhere is Riz Ahmed (Nightcrawler, The Night Of, and other projects without the word “night” in the title) as a slick tech CEO whose Silicon Valley startup is entangled in the plot for reasons of token timeliness. These actors, and Stiles (who doesn’t have enough to do, but that’s true of every movie for nearly 10 years now), go a long way to grounding the thin, insubstantial plot in something like weighty gravitas. They carry scenes of endless exposition by making it believable that these characters would speak to each other in terse jargon-filled exchanges of information. Damon, for his part, shows up after a rigorous workout all muscle, and keeps his head down, mostly silent with a few bursts of interrogation. He’s determination incarnate. Greengrass bookends the film in outbursts of violence and action, the first an escape through a riot in Greece that’s merely hectic, the finale a slam-bang car chase that includes a hijacked armored SWAT van plowing through a traffic jam in a most impressive display of stuntwork. It’s filmed, as you’d expect, in impressionistic smears of chaos cinema, a shaking camera and quick editing that are less precise here than the Bournes have previously been, but it gets the job done. The least in the series, Jason Bourne is nonetheless a reasonably competent thriller coasting on affection for its predecessors. It’s a pleasure to be back in the recurring ideas and images of these films. The paranoid surveillance plotting can’t undo the comfort food elements of clever prop use in action beats, people snapping orders into headsets, hackers typing furiously, suits staring alternately intently or slack-jawed at screens and case files, Bourne talking on the phone to someone he’s watching through a scope, sudden blasts of gunfire, teeth-rattling car stunts, and Moby’s “Extreme Ways” playing us out into the end credits. 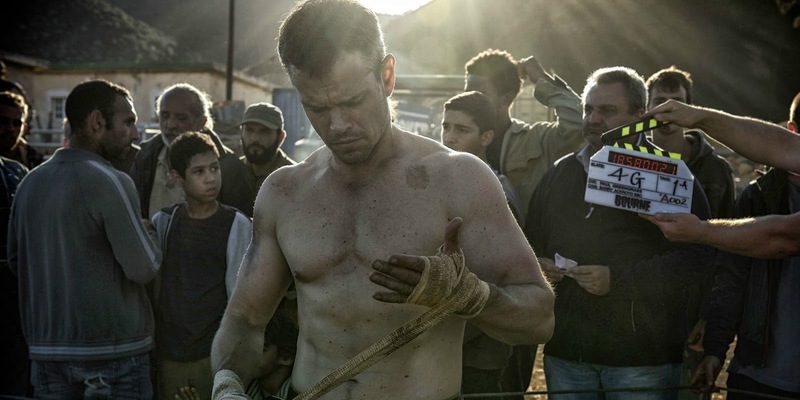 The filmmakers’ bid to make the story matter either as a comment on our current world problems – “This could be worse than Snowden,” we hear twice – or to its characters lives – secrets even more closely intertwined with Bourne’s past – mostly falls flat. (That it repeats an inciting incident from The Bourne Supremacy is unfortunate, too.) And in the end the biggest surprise is how long it takes to have so little happen. But there’s that unstoppable competency driving everything along, elevating what could be totally disposable to the realm of passable diversion. A teen thriller with mostly proper proportions of coolness and ridiculousness, Nerve has timely techie tension. It’s about an underground app that’s a secret viral game allowing paying watchers to vote on dares for live-streamed players to do for quick cash payouts. That’s scary enough as, given the Internet’s capacity for mob mentality cruelty and weaponized peer pressure, it’s not hard to imagine all the ways this game can go very wrong very fast. And you only have to look as far as this summer’s smart phone sensation Pokémon Go to see how the right reward structure can send hundreds or thousands of gamers out into public places for their own digital glory. The game in the movie, also called Nerve, is like a combination Periscope and cam site, filled with amateurs doing things for anonymous crowds who drool and banter in the comments section and happily fork over money for the privilege of voyeurism. The stunts grow increasingly dangerous, and our protagonist is progressively more vulnerable to the game’s clutches. The movie gets broader and flimsier as it goes along, but remains unnervingly plugged into ambivalent paranoia about our current technological moment. Directors Henry Joost and Ariel Schulman, of Catfish and Paranormal Activity 3 (the best of that series), create a convincing world of connectivity, threading Unfriended-style screen-eye-view shots with a mood of neon glow and pulsating pop score, t then throwing superimposed comments, texts, and screen names onto frames. There’s cool clutter to its vision of modern communication. Vee heads out into the New York City night, where Nerve’s dares lead her to team up with Ian (Dave Franco), another player. He’s a motorcycle-riding, leather-jacket-wearing, sensitive smart guy, the better to somewhat neutralize the threat of zipping off with a stranger. (Besides, a low angle on them astride his blue-glow bike under aquamarine fluorescent lights is just about as cool as movies get.) This isn’t about real life stranger danger; it’s about the Internet’s dopamine hits of fleeting fame-iness overriding good judgment and common sense. Who doesn’t want likes, hearts, page views, hits, faves, views, and retweets? Vee and Ian shoplift, drive recklessly, hang from deadly heights, and more, all in the name of the attention, and the cash. The whole thing’s shady, but who cares? It’s fun for her, a live-on-the-edge coming-of-age, right up until it isn’t. Eventually our leads discover the anonymous deviants behind Nerve’s coding have a stranglehold on players’ personal information. They could drain bank accounts. They could ruin reputations. The only way out is to win. The back half of the movie grows increasingly paranoid. American Horror Story writer Jeanne Ryan, adapting the book by Jessica Sharzer, generates tension like a YA version of The Game, albeit with a different twist. Everyone they meet – and everyone on the street, or in the background, or mingling in a crowd – might be a watcher or a player. The one-crazy-night After Hours set up grows creepier and more threatening, mining the disjunction between online speech and real world action as totally unaccountable watchers coax risky, even illegal, behavior out of players who can’t help themselves. (Most intense is Colson Baker as a player eagerly taking dares that lead him to, say, lie flat on the subway tracks.) In the end, Nerve’s conclusions are a bit easier and sillier than what the premise could’ve found, with a climax not nearly as tight as the opening acts, but the movie is filled with energetic and empathetic performers carried along by the filmmaker’s total commitment to a slick, scary, groove. This is a nervy, well-timed, cool pop thriller confection.